SS1 and JH5 Free Float traps were among the TLV models implemented at the refinery. TLV and Enproserve (a TLV distributor) assisted a Malaysian petroleum refinery with their steam system, resulting in over RM3.6 million (approx. $980,000 USD) in net savings through improved steam trap management. A substantial number of steam trap failures in 2012 lead PETRONAS Penapisan (Terengganu) Sdn Bhd [PP(T)SB], a subsidiary company of PETRONAS in Malaysia, to reach out to TLV for assistance. Upon conducting a steam trap survey, TLV discovered a trap failure rate of about 53% directly responsible for an estimated RM 0.98 million in annual losses. This estimate does not include losses due to steam leaks from pipes and other valves. In response to these shocking figures, the Technical Service Department Team at PP(T)SB worked with TLV and Enproserve (M) Sdn Bhd to replace the failed steam traps, repair leaking pipes and valves, and implement steam trap inspections to monitor performance. 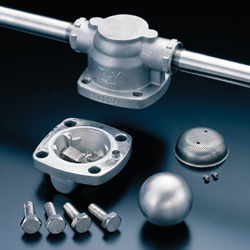 Approximately 32% of existing thermodynamic steam traps were replaced with energy efficient TLV models with modified connections to improve maintenance efficiency and reduce steam loss. Aside from the replacement of failed steam traps, condensate discharge locations (CDLs) were also reconfigured to enhance the steam traps’ reliability. With the increase in condensate return, PP(T)SB saw immediate improvements in steam savings after the plant resumed operation in July 2014. Pleased with the improvements achieved by the program, PP(T)SB Management commented that TLV’s Trap Management System is a “high return project which minimizes steam/condensate loss and resolves low-reliability steam trap issues.” They also added that they recommend replacing and upgrading remaining in-service traps to further reduce steam/condensate loss at all areas during the next shutdown. The project resulted in an estimated RM 3.6 million in savings through improved steam trap management, as well as a reduction in the plant’s carbon footprint and energy consumption. With more effective condensate removal, the risk of water hammer was also significantly reduced, allowing for safer operation in the plant.